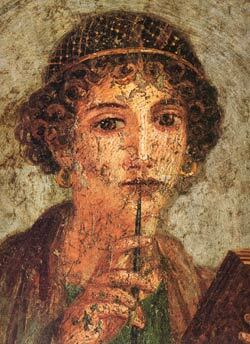 Sappho, Roman wall painting from Pompei. James Romm, at the Daily Beast, has some very important news. [T]wo poems came to light when the owner of an ancient papyrus, dating to the 3rd century A.D., consulted an Oxford classicist, Dirk Obbink, about the Greek writing on the tattered scrap. Dr. Obbink, a MacArthur fellow and world-renowned papyrologist, quickly realized the importance of what the papyrus contained and asked its owner for permission to publish it. His article, which includes a transcription of the fragmentary poems, will appear in a scholarly journal this spring, but an on-line version has already been released. Despite Sappho’s fame in antiquity and huge literary output, only one complete poem of hers survives today, along with substantial portions of four others. One of those four was substantially recovered only in 2004, also from a scrap of papyrus. Dr. Obbink’s new find adds a precious sixth poem to the body of Sappho’s surviving work and inspires hope that more such recoveries lie ahead. “The new Sappho is absolutely breath-taking,” said Albert Henrichs, a Harvard classics professor who examined the papyrus with Dr. Obbink. “It is the best preserved Sappho papyrus in existence, with just a few letters that had to be restored in the first poem, and not a single word that is in doubt. Its content is equally exciting.” One of the two recovered poems, Prof. Henrichs notes, speaks of a “Charaxos” and a “Larichos,” the names assigned by ancient sources to two of Sappho’s brothers but never before found in Sappho’s own writings. It has as a result been labeled the Brothers poem by Prof. Obbink. “There will be endless discussion about Charaxos and Larichos, who may or may not be Sappho’s brothers,” Prof. Henrichs commented. One important point in that debate will be the Brothers poem’s clear implication that Charaxos was a sea-going trader. The historian Herodotus, writing about two centuries after Sappho, also describes Charaxos as a wayfarer—a man who traveled to Egypt, where he spent a fortune to buy the freedom of Rhodopis, a beautiful slave he had fallen in love with. Upon his return home, Herodotus relates, Sappho brutally mocked her brother’s lovestruck folly in one of her poems. A horizontal line on the papyrus indicates the end of the Brothers poem and the beginning of the next, an address to the goddess Aphrodite. Only scattered words from this second poem can be recovered from the papyrus, which grows more tattered and illegible toward the bottom. To judge by what is known of Sappho’s poetry generally, this poem may have taken the form of a request that Aphrodite aid Sappho in the pursuit of a beloved, whether male or female. The two poems share a common meter, the so-called Sapphic stanza, a verse form perhaps devised by Sappho and today bearing her name. Both belonged therefore to the first of Sappho’s nine books of poetry, and their recovery gives a clearer glimpse than scholars have ever had into the makeup and structure of that book. “All the poems of Sappho’s first book seem to have been about family, biography, and cult, together with poems about love/Aphrodite,” Dr. Obbink writes, adding that the two thematic groups may have alternated throughout the book as they do on the papyrus. Sappho wrote in a dialect of Greek called Aeolic, significantly different in sound and spellings than the Attic Greek that later became standard. The papyrus in fact contains a few markings where a scribe, judging that Aeolic Greek might be unfamiliar to readers, made cues for correct pronunciation. It also bears the marks of an ancient tear and a patch job—a place where, after some rough handling, the original scroll was spliced back together with a pasted-on papyrus strip. The handwriting on the papyrus allowed Dr. Obbink to establish its date as late 2nd or 3rd century A.D., almost a millennium after Sappho first wrote. It was not long after this time that texts written in Aeolic and other non-standard dialects began to die out in the Greek world, as the attention of educators and copyists focused increasingly on Attic writers. Sappho, along with many other authors, became a casualty of the narrowing Greek school curriculum in late antiquity and the even greater selectivity of the Middle Ages when papyrus scrolls were recopied into books. The new Sappho is the best preserved Sappho papyrus in existence, with just a few letters that had to be restored in the first poem, and not a single word that is in doubt. Its content is equally exciting,” said a Harvard classics professor upon examining the papyrus. One of the two recovered poems speaks of a Charaxos and a Larichos, the names assigned by ancient Greeks to two of Sappho’s brothers, though never before found in Sappho’s own writings. The poem is set to cause discussions about whether or not the two men are Sappho’s brothers. It depicts an exchange between two people concerned about the success of Charaxos’ latest sea voyage. The speaker may be Sappho herself, but the loss of the poem’s initial lines makes this unclear. A horizontal line on the papyrus indicates the end of the first poem and the beginning of the next, an address to the goddess Aphrodite. Only scattered words from this second poem can be recovered from the papyrus, which grows more tattered and illegible to the end. The two poems share a common meter, the so-called Sapphic stanza, a verse form perhaps devised by Sappho and today bearing her name. Both belonged, therefore, to the first of Sappho’s nine books of poetry and their recovery gives a clearer glimpse into the makeup and structure of that book. “All the poems of Sappho’s first book seem to have been about family, biography, and cult, together with poems about love/Aphrodite,” Dr. Obbink writes.